Each of the newly seconded/recruited researchers was assigned a “mentor/mentee” for the duration of their stay in each institution. The mentor/mentee was chosen from the research groups which the incoming researchers entered. The person assigned the mentor/mentee role served two purposes. Firstly, as mentor he/she was tasked with helping the incoming researchers in practical ways to settle into their new environment – this may help ranged from the technical advice and guidance related to the work in hand to advice in finding suitable living accommodation. This system ensured that the incoming researchers made progress in their projects as quickly as possible and ensured that any time-losses during the initial settling in periods were minimized. Secondly as mentee, he was tasked with consciously learning through the implementation of a learning outcomes plan which was aligned to the deliverables and objectives of the project from the incoming researcher and working as closely with them as was practicable in order to absorb and subsequently use as much new knowledge and skills as possible from their new colleague. The consortium partners have already completed number of different events which ensured transfer of knowledge amongst themselves and also between themselves and the wider scientific and commercial community. The aim of these events was also to deliver training to the researchers on how they can best benefit from the opportunity of working on this project with respect to acquiring and transferring knowledge and skills to and from one another. As well as focusing on discussion on core areas of expertise of each of the partners and how they relate to the project in hand, the symposia also focused on the generalities of the core differences between research undertaken in an academic and environment and research undertaken in a commercial environment. These events took the form of regular international meetings (facilitated face to face and by Skype), International conferences, workshops and training events. International Meetings Meetings were held mainly biweekly, and minutes were taken. Here detailed discussion on the progress and future direction of the project were held. Partners met mainly face to face, with DIPM staff teleconferencing in so that all consortium partners were present. These meeting included technical discussion providing research fellows with feedback on progress and guidance on work plans. Workshops DNA Extraction Workshop ClouDx-i researchers held a workshop on DNA extraction from Staphylococcus in the labs at CIT. The researchers found the procedure very interesting and it was useful to see what happens in practice, such as seeing a culture, the sample being heated and washed until finally seeing flakes of DNA. Early Life Response to Infection and Immunity Workshop A workshop entitled “TOWARDS A STRATEGIC COLLABORATIVE RESEARCH PROGRAMME IN EARLY LIFE RESPONSES TO INFECTION AND IMMUNITY” took place in Edinburgh 10th September 2013, in the Pollock Suite of St Leonard’s Hall, with contributions from ClouDx-i researchers. This gave the fellows an ideal opportunity to review the challenges in Neonatal care and deliberate on how to progress research. Away days The idea of an away day to get out of our normal working environment and to give a bit of mental space to discuss progress to date and strategy going forward. The Away Days took place at 6 month intervals in a conference room at the Kingsley Hotel, Victoria Cross, Cork. In attendance were ClouDx-i members from CIT and Nsilico. 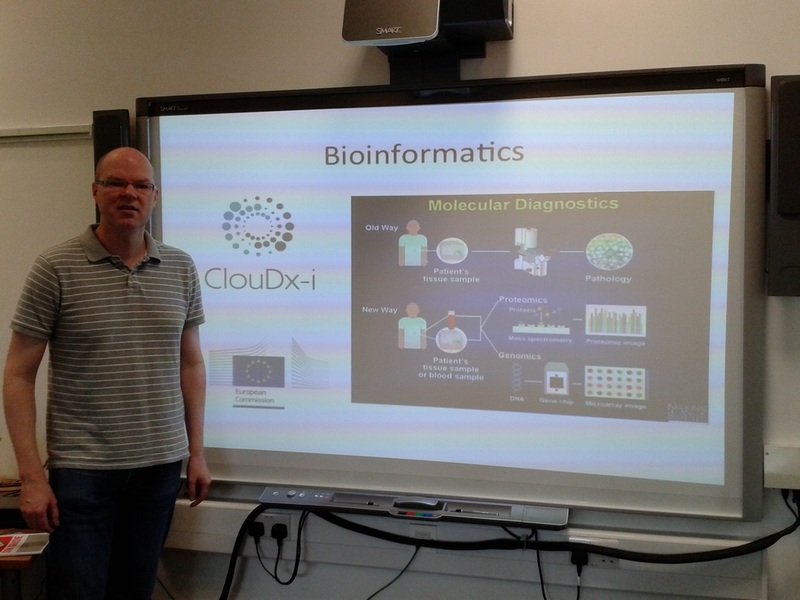 Cloud Computing Workshop CIT Research fellow Vlad Belogrudov gave a detailed workshop on Cloud Computing for Molecular Diagnostics 15th May 2014. The work shop covered detail lectures on Big Data, Distributed Data Management, Hadoop, Hadoop Demo, VRTX infrastructure, Pipeline software. 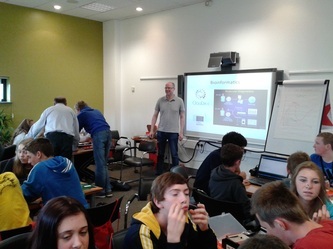 Detailed practical demonstrations were also given on Hadoop coding. DNA Extraction Workshop Follow up workshop on wet labs DNA extraction was conducted by fellows on 3rd of September 2014. This allowed industry partners to get a detailed overview of the complete end to end pipeline for pathogen analysis for neo-natal sepsis. Trade Shows and International Conferences Peer-reviewed publications and presentations at national and internationals workshops and conferences were produced so far throughout the project. This has facilitated dissemination of the results from the project and has added to the body of knowledge in the area. This will significantly enhance the reputation of each of the consortium partners and add to their future capabilities and competitiveness. CERC 2013 It was planned to run an international meeting in Edinburgh at which each of the researchers involved in the project will present in the same forum as invited guest speakers from both the commercial and academic sectors. This meeting was moved to CIT, which hosted the Conference on European Research Collaboration. The aim was to both disseminate the results emanating from the project whilst at the same time bring in new expertise into the consortium (through the invited participants) and seek new opportunities for collaborations. The Collaborative European Research Conference (CERC) http://cerc.cit.ie is the result of a long standing research collaboration between Cork Institute of Technology (CIT), NSilico and other organisations and Universities around Europe. 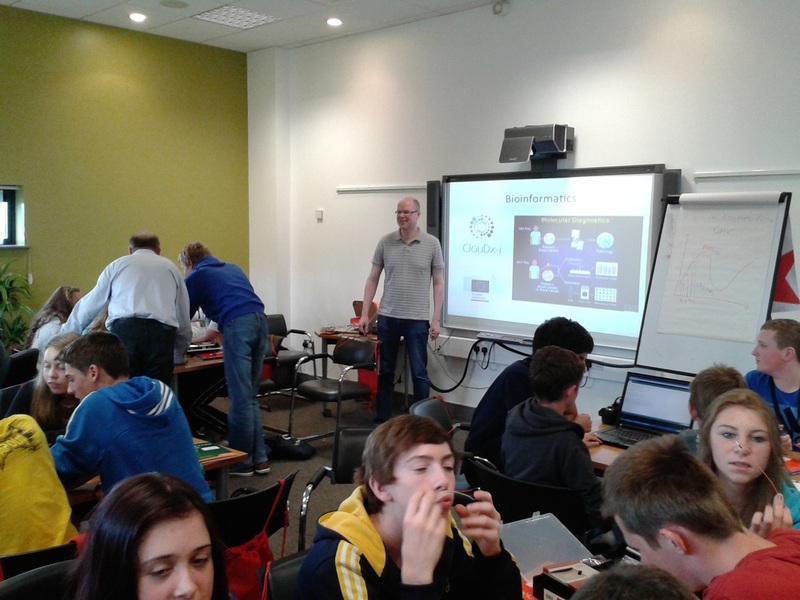 CERC 2013 was hosted by CIT in Cork, on the 17th and 18th of October. DIPM was an integral part of this project with fellows invited to give a Key Note speech about research in Detecting bacterial infection from a single drop of blood using host RNA transcription. Neonatal Society Meeting Summer 2013 The Society's summer meeting was held on June 27th and 28th 2013 in Edinburgh. Researchers from all ClouDx-i members were in attendance. eChallenges e-2013 eChallenges e-2013 Conference (09 - 11 October) was the twenty-third in a series of annual technology research conferences supported by the European Commission and hosted by national governments. 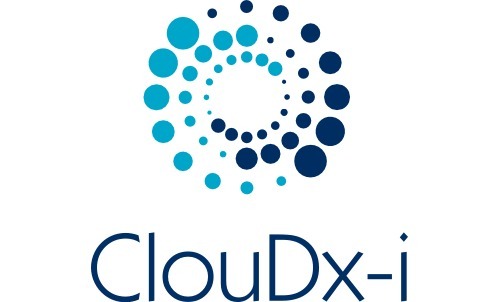 Cloudx-i fellows presented outputs of the ClouDx-i project when they presented a paper entitled “Democratising Life Science with Cloud Computing ”. The paper was warmly received and opened up many questions and feedback from the floor. Next Generation Sequencing Data Congress 2013 Cloudx-i Research fellows Chaired the bioinformatics sessions at the Next Generation Sequencing Data Congress 2013 in London June 2013. Over the 2 days, the conference provides an overview of the current and innovative methods in which leading scientists use to analyse and interpret NGS sequence data generated from Genomics and Genetics research. SynBio Conference ClouDx-i researchers contributed to the SynBio Conference in Cork March 13th 2014. In attendance also were research follows from ClouDx-i. PRACEdays14 Cloudx-i fellows presented ClouDx-i research at PRACE Scientific and Industrial Conference 2014 (PRACEdays14) 20-22 May 2014 Barcelona – UPC North Campus – Vèrtex Building (Pl. Eusebi Güell,6). This research is supported also by PRACE (Partnership for Advanced Computing in Europe), which was fostered by DIPM’s links partnership with University of Edinburgh’s centre for parallel computing. 2014 IEEE International Conference on Bioinformatics and Biomedicine (BIBM14) The ClouDx-i team attended and participated at the Conference on Bioinformatics and Biomedicine (BIBM) in November 2014. http://scm.ulster.ac.uk/~bibm/2014/index.html. The ClouDx-i team hosted an invited workshop at the conference, where it served as an ideal opportunity to publically disseminate the research outputs of ClouDx-i whilst also providing an opportunity for ClouDx-i research fellows to engage in transfer of knowledge. The workshop will focused on the ClouDx-i supported pipeline software platform that allows users to move rapidly from raw data to reporting. The BIBM conference provided an informal and vibrant forum for researchers and industry practitioners alike, to share their research results and practical development and provide feedback on how great science can be achieved. The Irish Next-Generation Sequencing Meetings consisted of a diverse set of talks on different applications of next generation sequencing technology. NSilico and CIT ClouDx-i members attended and presented at these conferences and talked to several people representing hospitals who were beginning to move towards NGS. AMR Forum Researcher from NSilico and DIPM participated in the anti-microbial resistance forum November 18th 2015. Neonatal Window of Opportunity Invited talk by Peter Ghazal, The University of Edinburgh, on ClouDx-I project, at the Herrenhausen Conference: "The neonatal window of opportunity, early priming for life" December 5-7, 2016. Herrenhausen Palace, Hannover, Germany. CERC 2016 All partners attend the CERC 2016 conference: http://www.cerc-conference.eu/. Papers were read from NSilico, CIT and DIPM researchers.